OTTAWA, Ontario - March 19, 2019 - PRLog -- Bloomex Canada is proud to announce the launch of a new "Get and Give"campaign with the ALS Society of Canada (ALS Canada), that allows supporters of the ALS community and cause to give back while receiving a discount on their purchase. This campaign is part of a new partnership that will continue throughout 2019. Amyotrophic lateral sclerosis (also known as Lou Gehrig's disease, or motor neuron disease) is a disease that gradually paralyzes people because the brain is no longer able to communicate with the muscles of the body that we are typically able to move at will. Over time, as the muscles of the body break down, someone living with ALS will lose the ability to walk, talk, eat, swallow, and eventually breathe. There are an estimated 3,000 Canadians living with ALS at any one time. Each year approximately 1,000 Canadians die from ALS and a similar number are diagnosed. As a proud partner of ALS Canada, Bloomex will support fundraising efforts by providing a special partner account on Bloomex.ca. This sign up page is available to anyone who wishes to support ALS Canada. By signing up at this account, you will receive a 15 percent discount on any purchase made during 2019 at Bloomex.ca. In addition, Bloomex will donate 10 per cent of each purchase to ALS Canada. To sign up for this discount click and support ALS Canada click here. Bloomex will also design a special bouquet which will be available across Canada on Bloomex.ca during ALS Awareness Month in June 2019. Fifteen percent of each bouquet purchase will be donated to ALS Canada. Bloomex is also proud to be the Official Florist of this year's ALS Canada Research Forum in Toronto. Hosted by ALS Canada, this invitation-only event is an opportunity to hear about the promise that scientific advancement holds for ALS. It will be attended by over 300 passionate and engaged leaders including researchers, clinicians, partners, donors, advocates and people and families living with ALS. Bloomex will be providing centerpieces, as well as $10 gift cards for all attendees. "We are delighted to partner with ALS Canada," says Sue McDonald, Director of PR and Corporate Sponsorship at Bloomex Canada. "ALS can take a devastating toll on both patient and family. Bloomex is proud to help the effort in providing support for those diagnosed and in funding research to find new treatments, or even a cure." "It's so exciting to see this partnership with a company like Bloomex," said Denis Blais, who was diagnosed with ALS in 2015. "It means a lot to the ALS community as well as the many people who have connections with the disease. With a partnership like this, people can donate to the cause all through the year, just by offering flowers, or gift baskets to their loved ones. Everybody wins, it's fabulous! Thank you Bloomex for stepping up and supporting people living with ALS." Bloomex is the largest florist in Canada. Orders are taken and processed through the company's site at Bloomex.ca or by phone, and then delivered to customers via local courier. 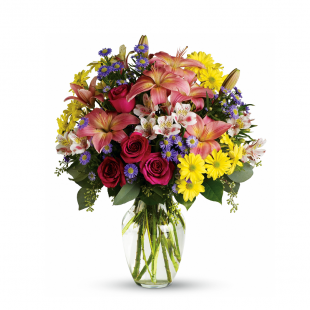 In addition to flowers, Bloomex offers a variety of other gift items including plants, gift baskets, gourmet foods, sweets and treats, balloons and other items. The company serves Canada, the US, and Australia. To learn more about other Bloomex campaigns click here.